9 Awesomely Random Cleaning Tips You’ll Wish You Knew Sooner! Hey there, my BOLD Ones! It’s 10 o’clock on a Friday night and here I am thinking about cleaning. What? I’m always running across some cool tips and tricks and thought I’d share a few with you. And now you, too, can stay up and dream of ways to clean the weird and/or frustrating things in your home. Oh, this is a necessary, and somewhat embarrassing part of my life. I admit it. 2. How to actually use all those vacuum cleaner attachments! If you’ve ever wondered what all those vacuum attachments were for and how to use them, wonder no more! Courtenay does a great job of explaining what all those crazy things are meant to do. 3. How to Freshen Your Whole House – Naturally! This little tip is so simple that you’ll smack your cleaning brain twice! And you can add the scent based on season if you want! Pine trees at Christmas without needles going everywhere. If you have some big bottles lying around that need some TLC, here’s how to do it. Yuck and gross. These suckers seem impossible to remove, but, hooray, there is an answer! 7. How to Freshen Carpet – Naturally! No Harsh Chemicals or Smelly Cleaners! Put away those aerosol cans of gross carpet cleaners and do this instead. Wow. It smells SO good! I love my cleaning bucket. Make yours today! 9. How to Renew Grout… even if it’s totally disgusto! One of my favorite tips for gross grout. I’m going to work on my other bathrooms ASAP. So, are you a cleaning tip junkie? What’s your favorite random cleaning tip? I’d love to know! P.S. 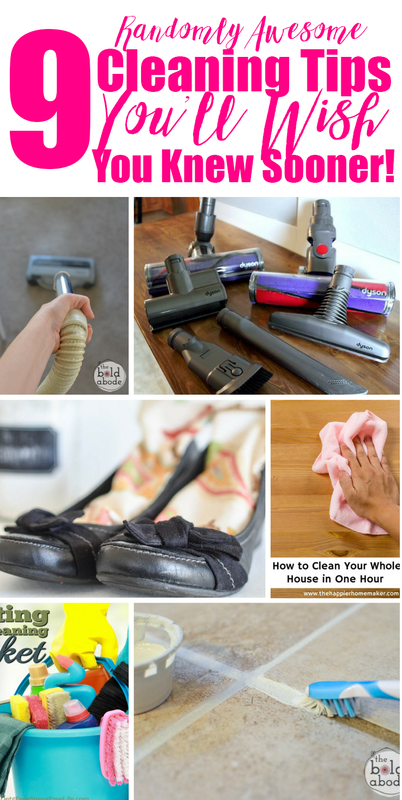 Follow my Cleaning Tips Board on Pinterest if you’re a real Cleaning Tip Junkie!